In 2011 where in the United Kingdom can you find Leyland Tigers, AEC Regals and Regents, Leyland Titans, Daimler Fleetlines, Bristol Lodekkas, Guy Arabs, both single and double deck, Routemasters and even more superbly restored buses and coaches – operating in service? The answer, The Kirkby Stephen Classic Vehicle Rally! 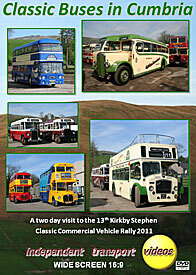 The independent transport videos cameras paid a visit to the 13th such event over the Easter weekend in 2011. The weather was kind on both days. We start our filming at the Rally site at Brough early on Saturday morning to see the vehicles getting ready to work hard over the event. We then take a ride on Cumbria Classic Coaches owned AEC Regal (JTB 749) for a run through the beautiful countryside to Kirkby Stephen West railway station. From here we film the buses in action running along the A685 road as we make our way to the Kirkby Stephen East station where we film the bus activity at this busy interchange. Our next ride is on board ECW bodied Daimler Fleetline DD294A (TGM 214J) in the livery of Eastern Scottish for the short ride into Kirkby Stephen. There is an almost continuous stream of buses and coaches passing through this pretty market town all captured on film for you to enjoy. We then ride back to Brough on board former Crosville open top Bristol Lodekka (627 HFM) that now belongs to Cumbria Classic Coaches. We alight at the Memorial Hall by the village clock to record further action, returning to the main rally site to see the buses there as well as the ‘Lake District’ Steam Passenger Bus! At the end of the first day, our cameras took up prime position by the clock in Brough to film the rally entrants passing by on the road run. As well as the buses and coaches, some commercial vehicles have also been filmed. Sunday dawned bright, sunny and cloudless. We start at the Brough rally site to see the new arrivals for the day and then jump on board former Lancashire United single deck Guy Arab (MTJ 84) for a run to the ‘West’ station. More action is filmed from the station and along the A685 with some of the most picturesque backgrounds you will find anywhere in the UK. We continue to film in Kirkby Stephen where there is a carnival atmosphere, and many buses passing by. We take a ride on another Guy Arab, this time a Massey double decker (UFJ 292) in the livery of Shaw Bros. To add variety we return to Brough on L544 (JDC 544L), a Daimler Fleetline in preservation in Teeside Municipal Transport livery. Our filming concludes with the buses leaving past the clock and from the rally site at Brough. What a fantastic rally? If you were there you can relive your memories, if not, just see what you have missed!! !